Both reserves are located in the Southern Province of Zambia. Most guests generally fly into Livingstone, Harry Mwanga Nkumbula airport in Livingstone. We personally assist the clients with their rifles and collect them from the airport. Bird Estate Reserve is the closest to Livingstone, just over an hour’s drive,150 kilometers, just East of Kalomo town. 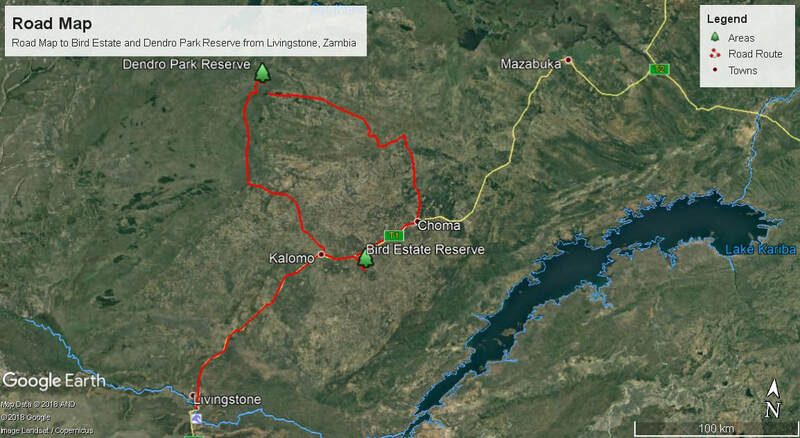 Following the great north tar road from Livingstone towards Lusaka, turning off 20 kilometers past Kalomo town onto a dirt road, heading South to the reserve situated on the Zambezi Plateau. Dendro Park Reserve is just over 5 hour’s drive from Bird Estate Reserve, 180 kilometers in the wet season, April to June. In the dry season 4 hours 140 kilometers, July to November. During the wet season the road is via Choma town, following the great North road again towards Lusaka, turning North at Choma town towards Marcha Mission. From the Mission one turns North/West onto a dirt road driving via the traditional farming areas to the reserve bordering on the Kafue National Park. In the dry season, the road is via Kalomo town, following the great North road back towards Livingstone to Kalomo Town. At Kalomo turning North onto a dirt road via Kafue National Park main gate, before heading North West to the reserve bordering on the Kafue National Park.